This is one of three posts I have scheduled related to Hergest Court. We will also have a look at Sir Thomas Vaughan (October 24) and his trials with four English kings and, in celebration of all things haunted, the mystery of Hergest Court (October 27). The Red Book of Hergest (Welsh: Llyfr Coch Hergest) is a large vellum manuscript written shortly after 1382, which ranks as one of the most important medieval manuscripts written in the Welsh language. It preserves a collection of Welsh prose and poetry, notably the tales of the Mabinogion, Gogynfeirdd poetry. The manuscript derives its name from the colour of its leather binding and from its association with Hergest Court between the late 15th and early 17th century. By the early 17th century, the Red Book had passed to the Mansels of Margam, hence back in Glamorgan. It was possibly brought into the marriage between Henry’s granddaughter Catherine Sidney and Sir Lewis Mansel, who is reported to have owned it in 1634. The manuscript is later found in the collection of Thomas Wilkins (d. 1699), a Welsh clergyman and antiquarian, who may have borrowed it from the Mansels without ever returning it. In 1697, Wilkins was visited by Edward Lhuyd, who spent some time copying a manuscript which might well have been the Red Book. In 1701, two years after Wilkin’s death, his son Thomas Wilkins the Younger donated the manuscript to Jesus College, Oxford. Internal evidence, a note by the latter Wilkins, suggests that Edward Lhuyd then held the manuscript on loan, but that the college was able to retrieve it only 13 years later, after Lhuyd’s death. It is now kept at the Bodleian Library on behalf of Jesus College, Oxford, and catalogued as MS 111. 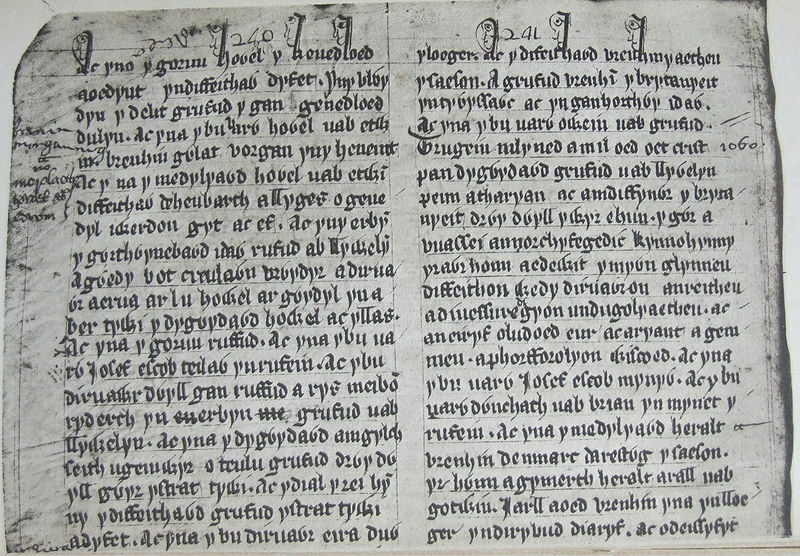 The first part of the manuscript contains prose, including the Mabinogion, for which this is one of the manuscript sources (the other principal source being the White book of Rhydderch), other tales, historical texts (including a Welsh translation of Geoffrey of Monmouth’s Historia Regum Britanniae), and various other texts including a series of Triads. 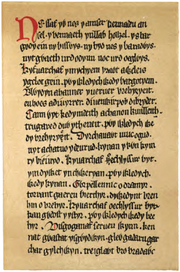 The rest of the manuscript contains poetry, especially from the period of court poetry known as Poetry of the Princes (Welsh:Gogynfeirdd or Beirdd y Tywysogion). The manuscript also contains a collection of herbal remedies associated with Rhiwallon Feddyg, founder of a medical dynasty that lasted over 500 years – ‘The Physicians of Myddfai’ from the village of Myddfai just outside Llandovery. J. R. R. Tolkien borrowed the title for the Red Book of Westmarch, the imagined legendary source of Tolkien’s tales. This entry was posted in British history, Great Britain, Wales, writing and tagged Hergest Court, King Edward IV, medieval manuscript, The Red Book of Hergest. Bookmark the permalink. I found this fascinating, It also makes me feel ashamed, like most Englishmen I have always tended to ignore Wales and Welsh history and culture whilst enjoying the singing of Male Welsh Choirs ( especially their National Anthem which I find the most thrilling anthem of all, closely followed by the French and American; GSTQ is way down my list). Many years ago I did read that the Welsh are the true English and those like me who call themselves English are in fact Anglo-Saxons. The last of the true English apparently after a last battle at Glastonbury escaped to Wales where the AS were loathe to venture. You may well be the right person to enlighten me as to the truth of the matter. .
I’m looking forward to the next two instalments.